Some thoughts on the role of a pastor… and why that’s really important to understand for everyone that’s not a pastor! It seems important that when Paul talks about the Church, he embeds it in the image of Jesus as a healing King. The identity of the Church has to take first take into account the consistently proclaimed message of Jesus that the kingdom of God was near. This is anything but an abstract idea – it affects everything about everyone of us. When that which God has created is under the complete management and rule of Jesus the King, we operate according to our design and thrive and flourish. When that which God has created is not under the complete management rule of Jesus the King, we self destruct and fall apart. So what does that have to do with the identity and role of pastors? Could that be more opposite than what Paul says here? What image is the identity of the Church wrapped around? A healing King. That means that when an individual is deeply involved in the life of a church, they should be able to sense that they are both experiencing the healing of the King and becoming ambassadors of that same healing ministry. V8 says that the King has come bearing gifts for his people, so what else could that mean? We partake of the gift of grace, and we then use our gifts to extend it to others. We are recipients of his healing power, and we are also contributors to his healing plan. That is fundamentally what church is about. Paul has now made his point in two different ways – first, a healing King and second, a people engaged in works of service – but that is still not enough for him. At risk of overkill, he applies one more image to get the point across. He says that the people of God are to be equipped for works of service, so that the body of Christ may be built up. First, we embed the identity of the Church in the greater identity of Jesus the Healing King. He has already won, already risen, and has distributed gifts to those that are connected to him by faith to experience the wholistic healing that comes form him. Second, we recognize that Jesus has placed some folks in pastoral leadership to make sure that his healing project continues on course. They are responsible for a number of things, but chief among them is ensuring that the people of God are equipped to participate in works of service, which then extends the ministry of the healing King. Third, and most mystically, he says that when these first two happen, the body of Christ becomes manifest before our very eyes. The same Jesus who lived in human form and dwelt among us becomes tangibly active once again in our midst. The same healing King who was bringing all things to himself becomes physically present when his people join by faith in his healing movement. I don’t do this often, but if I may, I’d like to summarize this with a pointed message first for pastors, and then for everyone who is not a pastor but who takes church very seriously. There are many things that are required of us. 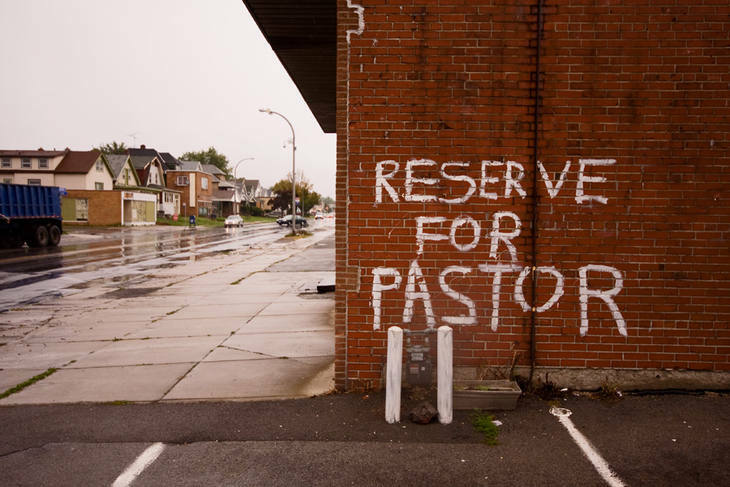 Pastoring is one of the most demanding and unforgiving jobs out there. I commend you for taking your role seriously, and for giving the best of your time, energy, and passion to the work of Christ through the Church. As we continue in our calling, lets never forget that amongst the long list of expectations, what is listed here is among our primary responsibilities. Christ himself has appointed us to equip his people for works of service, so that the body of Christ may be built up. We get the privilege of pointing to a risen and resurrected Jesus that is King over this whole world. We serve a Jesus who is healing and renewing all things, and that should start with us. Our lives should reflect the healing power of Jesus, and our ministry should reflect a full surrender to the One who is establishing and advancing his Kingdom. Let us not grow weary and doing good, regularly reminding ourselves of verses like 1 Corinthians 15.58. I know that many of you who are reading this are serious Christ followers, and therefore you are also serious about the local church. I’m grateful that you are. To you, and to all those who are even marginally involved, I believe this is one of the most important passages in the Bible for clarifying what we should expect both from the local church and from those that God has placed in positions of spiritual leadership. Pastors should take seriously the task of lifting up Jesus, to call us to spiritual maturity, to… in the words of Paul, “become mature, attaining to the whole measure of the fullness of Christ.” The primary job of a pastor is not to preach pleasing messages or be available 24/7 to whatever need might come up (though I realize availability of pastors is important). Primarily, pastors should be lifting up Christ, establishing paths for growing maturity, and igniting/equipping you to do the work of the Church. One of the easiest traps to fall into in our modern day church culture is to slip into a consumption oriented approach to church, looking for all the ways it can serve my agenda. To do so is conspire with the individualistic narrative that strips away our ability to join with a healing King that is renewing all things in the world. Remember – you are connected by faith to the most fearsome and wonderful power in this Universe. He has already ascended, already taken his throne, and is already at work in this world. He has gifted you to join him, and created the local church to inspire and equip that to happen. The final words of this passage remind us that it is from Jesus… that each one of us does our part. The stakes are high, and you are needed. Would be interested on your input regarding Hugh Halter’s new book, BiVO(as it relates to this series). I have not read it yet; but, have loved all his previous books, along with his more (w)holistic faith/life perspective… He gets that current church ways are not working well in a post-Christian culture… I find his approach refreshing. I haven’t heard of him yet Diane. Does he have anything online? Yes…he speaks at Verge & other missional conferences; so, you could find some links. His first book, The Tangible Kingdom had a huge impact on me when I was on church staff in SoCal, trying to get a So Baptist-based church crowd to move beyond betterment into real life relationships. Also wrote Sacrilege & And… has some papers out there, too. Heard him at New Thing Network in Aurora w/ Hybels… I enjoy his real & sometimes raw style, as I am weary of waterfall teaching in this season.